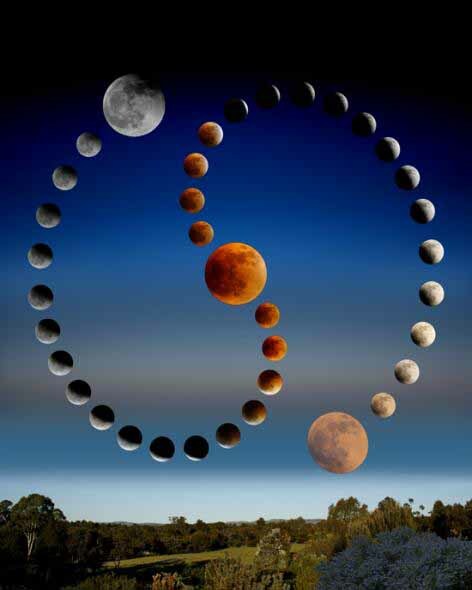 The lunar eclipse in Pisces – how is your lunar eclipse day, so far? The Virgo/Pisces eclipse season began in mid-September 2015 with a partial solar eclipse at 20 degrees Virgo. It concludes at the end of February 2017, including four attendant lunar eclipses, with the last of four solar eclipses taking place at 8 degrees Pisces. Today, on Friday 16th September, 19.55 BST, at 24 degrees 20 minutes Pisces, there is a lunar eclipse following on from the solar eclipse which occurred at 9 degrees 21 minutes of Virgo on 1st September 2106, 10.08 BST. Excitement is already mounting, since eclipses tend to produce “power surges” and crises of various kinds in our collective life. 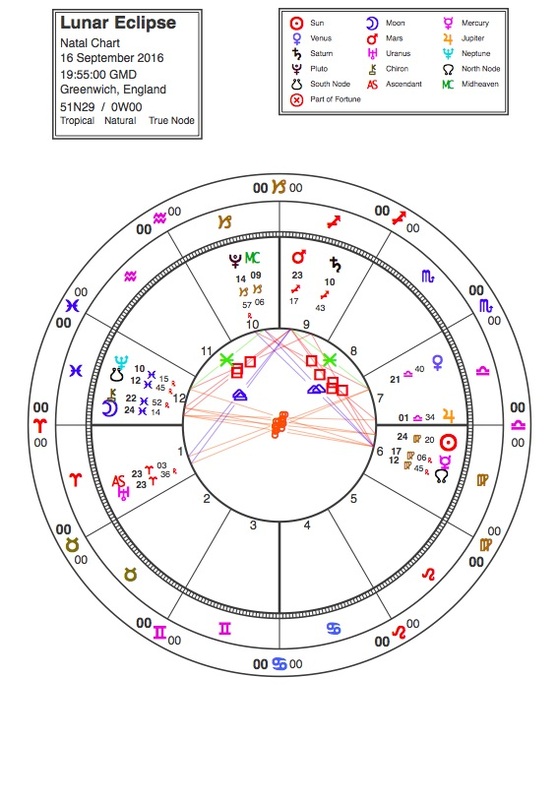 One striking lunar eclipse-related example this week is of Democratic presidential candidate Hilary Clinton’s much-publicised falling ill and staggering into her car, helped by aides, as she left the 9/11 commemoration early, suffering from pneumonia. Although she appears to have bounced back quickly, appearing in public again on Thursday looking cheerful and well, nevertheless this episode has not helped her presidential campaign against Donald Trump, who is running neck and neck with her in the polls at present. And what of their impact on our personal lives? How does that work? What should we expect from the September 2015 – February 2017 season of eclipses? 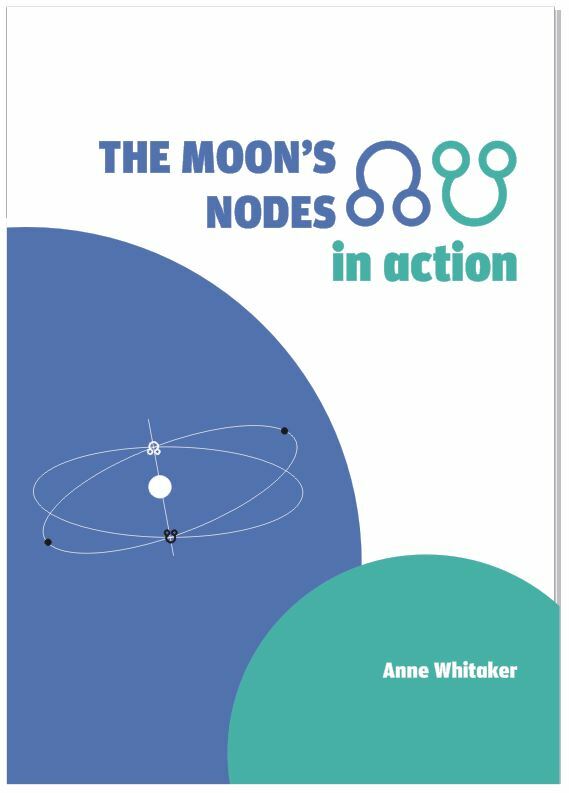 My major objective in conducting research into The Moon’s Nodes in Action – ebook published in 2015 – was to put actual flesh on the bones of all the theoretical stuff I had been reading about the Moon’s Nodes and eclipses over a period of many years. I wanted to find out whether the theory stood up in practice, arriving at my research conclusions via detailed study of six people’s lives. Three of the participants were ‘ordinary’ citizens: Marc, Andrew and Anna, and three were famous: Mary Shelley in relation to her authorship of Frankenstein on her first Nodal Return; Princess Diana of the UK and her untimely death on her second Nodal Return; and astronaut John Glenn’s return to space, in his 70s, two whole Nodal Returns after his first space trip. Individual eclipses are important, and can be viewed as progressive stages of an unfolding process. However, my research and subsequent astrology practice as well as personal observation has demonstrated that one should take note of the whole eclipse season of eighteen months, applying this to whatever pair of houses the Moon’s Nodes and eclipses (both solar and lunar) are moving through by retrograde motion. You should also take careful note of those planets/Angles/asteroids (if you use them) which are being triggered. It is also very valuable, in gaining perspective, to go back to the previous eclipse season nineteen years previously, to reflect on the changes brought then and how they may connect to what is coming up this time around. As always, I am interested in your feedback from YOUR experiences. How is your eclipse day going? What changes have there been in your lives since mid-September 2015? I am offering this research study, featured in 2015 on www.astro.com, as a FREE download to any student or teacher of astrology who is interested in learning more about a fascinating topic. This entry was posted in Eclipses (7 articles) and tagged Astrology, Centre for Psychological Astrology London uk, horoscope, lunar eclipse, Mary Shelley, Nodal Return, Solar Eclipse. Bookmark the permalink. Good stuff Sandra! All feedback welcome. Has it been dull since last Sept 2015 when Virgo/Pisces eclipse season started? Well I moved in March so that was a hectic insane month and I was in Canada for almost a week so not really. I have witnessed several friends deal with serious health issues, including mental problems since the Virgo/Pisces Eclipse season began. Today I am feeling sleepy after awaking in the middle of the night last night with a full batch of energy. Yesterday seemed low-key but today seems very drifty and difficult to focus. Yes, me too re the whole season so far, Margo. And three deaths, both my own family and in-laws. Annette Deal It’s been a good day so far. Very little anxiety compared to other full moon cycles..whew! Seems pretty typical of many of us, Ann. My husband’s phone phoned me, but he was sleeping! Go figure! This morning was easy as I had something definite to do, but for the rest of the day I couldn’t decide and was waiting for a phone call, so I messed about until I suddenly decided I must do something on my list, so I exercised for half a hour at 4.55 and felt better. My phone call finally came at about 6.30. Thanks, Jane, sounds a bit like my day! Many thanks for this detailed and illuminating feedback, Nancy! Sorry to hear that you have been having all those health problems. ” I am trying to relax, listen and go with what seems best even if it is to do nothing…” You have given yourself very good advice here! I do hope things gradually improve and many thanks for dropping by and participating, as well as for your ongoing interest in my various ventures. Many thanks for your affirming words, Silke. Some reflection on the unfolding pattern of our lives through those great cycles can provide considerable guidance which looking at the patterns of the immediate present, interesting though they are especially at the eclipse points, can not. Okaaay, so I went back & had a look-see at what life looked like for me at the last cycle….in view of your question, Anne, what a nuanced connection I discovered. Not so much neon-lit outward event time, but more a mirror between now & then what was/is going on in my head. 😯 But reflection is more like a delicate dance sequence from one place to another. Connections?!! You bet. Glad to see you have gone away and done your homework with useful results, Silke!